The T-70 is a Rank I Soviet light tank with a battle rating of 2.0. It was introduced in during the Closed Beta Test for Ground Forces before Update 1.41. 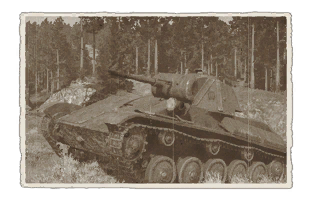 The T-70 is a very good light tank for its rank location and should be taken seriously if seen on the battlefield. The T-70 is an asymmetric vehicle with good mobility, average frontal sloped armour and the typical Rank 1 Soviet cannon: the 45 mm 20-K. It is manned by only 2 crew members, surrounded by two engines (right side), an ammo rack (left), transmission (front) and fuel tank (back). This tank makes for a surprisingly good low rank scout, and as an added bonus, can engage in front line combat when needed. The front armour is surprisingly strong, and can bounce shots from several similarly low rank opponents. The gun, while not the greatest, is very capable in combat. The major drawbacks of this tank occur when its engaged in urban combat, or against opponents with high penetration cannons. The side and rear armour is undeniably poor and combined with urban combat makes it very easy to get flanked. This leads to the tank largest flaw, in that it only has two crew. One penetrating hit will usually be the tank's end. Generally speaking in combat, stick to terrain with forests and hills. In these types of areas, the small stature of this tank can be used to hide it behind small hills, and use its gun in effective ambush attacks. Ammo racks for the T-70. 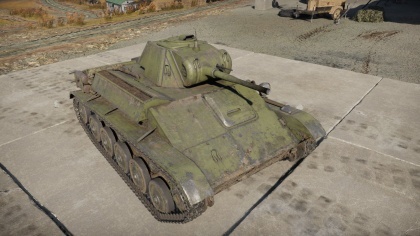 Unlike later tanks, the T-70 presents a strange configuration: motor and turret are side by side, meaning that exposing the tank's back will not immobilize it. With it's turret definitively leaning to the left, a smart player will prefer going around corners with the obstacle on the right side of the tank. This tactic has two effects: it decreases the size of the target for the enemy and protects the crew with the engine block, at the expense of being immobilized if shot from the right side. Try to avoid being shot to the left side since there is a big ammo rack on the whole left side of the vehicle. With two car engines crammed together, this small tank is less than 10 tons with 254 HP - a quite decent HP/ton ratio. Suspension is very smooth, providing some ability to fire on the move, but also making it more difficult to quickly engage an enemy after stopping, as the vehicle will keep rocking back-and-forth until the suspension settles. This puts T-70 at a disadvantage in sudden one-on-one encounters, so rushing for the nearest piece of cover instead of stopping to take aim may be a better option, unless the enemy is unaware of the light tank. While the hull's shape is similar to late and post-war soviet vehicles (T-54 1947, T-44, etc. ), it is shorter and not angled as much. Still, this armour configuration is efficient and makes the most out of this little amount of steel, meaning the tank can bounce some shots if angled properly. The lower frontal plate, while thicker, is not angled as much, but transmission prevents most shots from injuring the crew when penetrating. The frontal armour of the turret is a semi-circular 50 mm thick steel plate, which provides decent protection at long ranges (very bouncy). Thanks to its small profile, this tank's turret is nearly invincible when hulled-down at ranges since no gun is accurate enough at this BR to efficiently take down the light tank. Beware the thin side armour, however - most HMG's can penetrate it, and the ammo rack located on the left side makes the tank even more vulnerable, so make sure it's protected. Any player familiar with low-rank tanks will be comfortable with the 45 mm 20-K cannon. 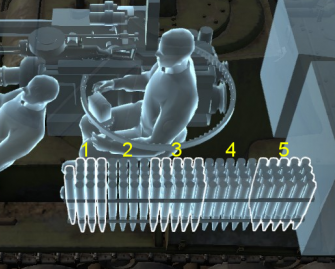 Some peculiarities to the T-70 is its good gun depression of -6° and slow turret traverse. Relatively good gun with high penetration. Compact size makes it a small target. Very slow turret traverse (hand cranked). In 1942, advances in armoured warfare caused light tanks in Soviet service to be considered inadequate in terms of protection, firepower, and mobility in comparison to the all-around T-34 medium tank. The only advantage the light tanks present was that small factories could produce these, unable to handle the machining process of the medium and heavy tanks in Soviet service. The two light tanks in service however, the T-50 and the T-60 were inadequate in terms of Soviet doctrine. The T-50 was complicated and expensive to produce, and the T-60 had poor cross-country mobility and a weak 20 mm autocannon. The T-70 light tank was designed to solve this issue, though it started with a glaring mechanical issue of having two engines, one for each track. The T-70M, a redesigned version that is still called the "T-70", fixes this with one engine on the right side of the hull and normal transmission layout. The turret was also changed in the "M" designation to be easily welded and moved to the left of the hull to compensate for the engine on the right. In the end, it was a 9 ton tank with a 45 mm gun and only had two crew members. However, at this point of the war, it is increasingly clear that the light tank and the role of an infantry tank were obsolete. The T-70 was also insufficient of coordinating an armoured unit due to the two crew members, forcing the commander in the turret to be a gunner, loader, and radio operator as well. An attempt to remedy this was the T-80 light tank design, which was a stronger T-70 with a two-man turret, but was deemed unnecessary and all light tank production ceased in October 1943, with the remaining ones issued to artillery units or other rear-echelon duties. Despite its inferiority, the T-70 had a few moments to shine. On July 6, 1943, Lt B.V. Pavlovich of the 49th Guards tank brigade engaged and destroyed four German medium tanks near Pokrovka village. In March 26, 1944, Sgt Alexander Pegov of the Third Guards tank army in a T-70 tank ambushed a Panther tank in a range of 150 to 200 meters with APCR rounds, setting it on fire. He immobilized another a moment later. The Panthers blocked a vital road as they were immobilized, and Pegov was decorated as a Hero of the Soviet Union. The T-70 was also used as the platform for the SU-76 Soviet tank destroyer, featuring a wider and longer chassis. The main production variant for this tank destroyer was the SU-76M. The T-70 was also used as a basis for an anti-aircraft platform called the T-90 SPAAG. This was cancelled in 1943 in favor of the ZSU-37 however, which is a repurposed SU-76M chassis. The T-70 served all the way to 1948 in Soviet inventory. Despite its inferior status, it was a valuable war commodity as it helped fill in roles when the T-34 couldn't be spared to do so. About 8,226 of this vehicle was produced during its production life of 1942 to 1943.